With 5G networks in the early stages of roll-out (with the possible exception of South Korea), user equipment not yet in consumers’ hands and the elements that are aimed at supporting vertical industries undergoing standardisation in 3GPP Release 16, this year’s Mobile World Congress Barcelona was always going to feel ever so slightly anticlimactic. That said, it was pleasing to see that after such collective effort across the industry, 5G is a tangible reality, as most graphically demonstrated by the launch of the first 5G smartphones, including Huawei’s Mate X and Samsung’s S10 5G. There was also a great deal of innovation on show. For instance, cloud-gaming platforms were present on several stands and I got to see a display on the Huawei stand that uses eye-tracking technology to give the illusion of 3D objects without the need for tinted glasses or a VR helmet. Two demos stuck out. 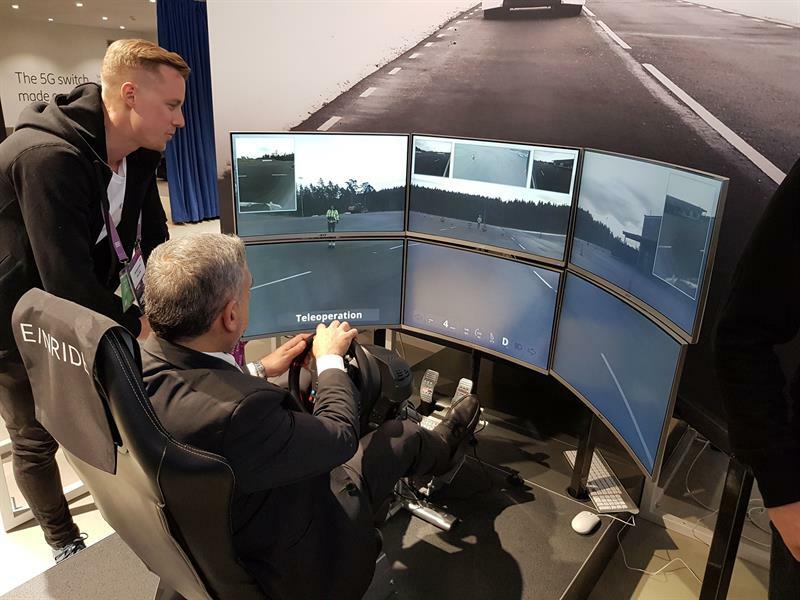 The first was a live remote driving demo on Ericsson's stand, where it was possible to drive one of Einride’s T-Pod cabless vehicles in Sweden. The intention is for fleets of these vehicles to operate autonomously, with the initial use-case being transporting goods between warehouses. In the Huawei stand’s ‘back garden’, a set-up streamed 8K video footage of a beach located 6km away over a 5G connection. This was to either a 5G smartphone or customer-premises equipment at a leisurely ~140mbps and a latency of 14 milliseconds. While I suspect this was barely testing the connection’s bandwidth, it was great to see an actual 5G set-up just outside MWC. Two of the company’s products, the RuralStar Lite and the 5G SkySite, may create cognitive dissonance for those countries which have expressed national security concerns over the use of Huawei equipment, given the need for systems that can bring down the cost of mobile broadband coverage to meet the high requirements of public safety organisations. The RuralStar Lite solution aims to provide affordable coverage to users in remote areas. The company claims that it reduces the capex per site to around $20,000 and shortens the return on investment cycle to about two to three years. The 5G SkySite has a 5G Book RRU base station integrated into an unmanned aerial vehicle to provide temporary coverage. The company claims to have reduced the base station’s size and weight and increased its capacity by 110 per cent. The onboard base station weighs 7kg. Flying at an altitude of 100 metres, Huawei claims that the 5G SkySite can provide coverage to a 20-30km2 area. The controversy over Huawei and national security was the subject of much fruitless discussion at MWC. Speaking at the company’s pre-MWC briefing, Ryan Ding, carrier business group president, said: “There is some impact on some countries but there will not be [an] impact on 95 per cent of our market. In other markets, Huawei has become a very popular topic – so to some degree this is [a] free advertisement for us.” He added that the GSMA’s recent call for a common, consistent and agreed security assurance, testing and certification regime for Europe would be an improvement in terms of efficiency. Ding also said that the security concern had encouraged Huawei to invest more in R&D this year. However, there was one new development during MWC: Mariya Gabriel, the European commissioner for digital economy and society, said her organisation recognised the need for a common approach to 5G cybersecurity. In the week after MWC Barcelona, Huawei opened its Cyber Security Transparency Centre in Brussels, which will showcase its end-to-end cybersecurity practices, facilitate communication with stakeholders and provide a product security testing and verification platform and related services to Huawei customers. It was clear during the pre-MWC media and analyst briefings that the emphasis has shifted from the race to develop 5G to trying to offer the best 5G equipment to mobile network operators. This is in terms of cost/bit, size, weight and energy efficiency, while also promising to bring them new AI-driven capabilities to optimise the running of their networks. He added that Huawei believes 90 per cent of sites can be upgraded to 5G using Huawei’s equipment without the need to upgrade the AC power supply due to its energy efficiency, and that its new 5G base station is sufficiently lightweight that it can be installed by two people without the use of cranes. Huawei is also pursuing a modular approach to 5G sites, using outdoor equipment that does not require equipment rooms or cabinets to reduce the total cost of ownership for operators. Rajeev Suri, Nokia’s president and CEO, said during his speech on the eve of MWC Barcelona that both its 5G AirScale Massive MIMO adaptive antenna and its 5G system module (which together form a complete base transceiver station) are liquid-cooled, and that this approach “delivers a 30 per cent cut in energy expenses, an 80 per cent cut in CO2 emissions and almost no noise pollution”. Suri (as he did last year) also highlighted the advantages of a single vendor approach to 5G, saying Nokia Bell Labs research has indicated that “a single integrated network solution model can deliver up to 30 per cent lower total cost of ownership, [higher] reliability and 45 per cent faster time to market for new services”. On the AI side, Ericsson’s updated dynamic orchestration solution introduces network slicing automation, comprising the creation, testing and development of network slices for the fast introduction of 5G services. It also includes AI-driven closed-loop automation for hybrid networks in a multi-vendor environment to allow issues that can potentially impact service delivery to be identified and for the network to be adapted in real time to ensure that these do not affect the end-user experience. Ericsson-acquired company CENX’s service assurance system will also be used to allow operators to easily visualise the state of their networks in real time. Ericsson claims that this overall approach can reduce the time needed to deploy new software by 30 per cent, reduce the time to market for new services by 70 per cent and reduce operational expenditure by around 30 per cent (with the bulk of the latter coming from AI-driven closed-loop automation). These capabilities were demonstrated by Peter Laurin, senior vice-president and head of business area managed services, during Ericsson’s pre-MWC briefing for media analysts, which took place on 18 February. He had a conversation with a chatbot regarding a UK network’s performance, in which it alerted him to a situation where a site in Manchester serving a high number of VIP customers was predicted to experience a critical throughput degradation and recommended a soft reset, an action which it expected to have minimal negative impact. It also warned of a weather forecast that predicted storms in Wales, created work orders for relevant sites to address this, mentioned that the system was using a digital twin technique and reported unusual behaviour at a site at Guildford and automatically assigned a ticket to address this. Laurin also mentioned that a machine learning project had managed to reduce the percentage of sleeping cells on a network in the Middle East to 0 per cent from 2.2 per cent in eight weeks. He highlighted that the combination of AI and human expertise allows engineers to be proactive rather than reactive and that Ericsson’s initial introduction of this kind of capability will start with the ability to address 15 specific use-cases, with another 30 “on the run and then we’ll add as we go forward”. Meanwhile, Huawei is working to enable AI and machine learning at both the equipment level (with new hardware for base stations) and at the network level. In the case of the latter, while announcing its MBB Automation Engine (MAE), Huawei said it expects its system to move from enabling partial automation to a conditional autonomous network in three years (with AI-aided decision-making and the AI working at the domain level). In addition, Nokia’s massive MIMO scheduler, which it developed in conjunction with Vodafone, uses machine learning to “substantially improve 5G Radio Access Network performance by optimally allocating radio resources to users and simplify the operation of 5G mMIMO”. The rise of AI-managed networks may have interesting (and unintended) long-term implications. During the annual Next Generation Mobile Networks (NGMN) Alliance panel session, which was largely focused on how mobile network operators can meet the needs of vertical industries, Howard Benn, head of standards and industrial affairs at Samsung Electronics, asked the operators as to whether they believe their role will be as important as it currently is in a few years’ time given the growing use of AI for operations and maintenance. 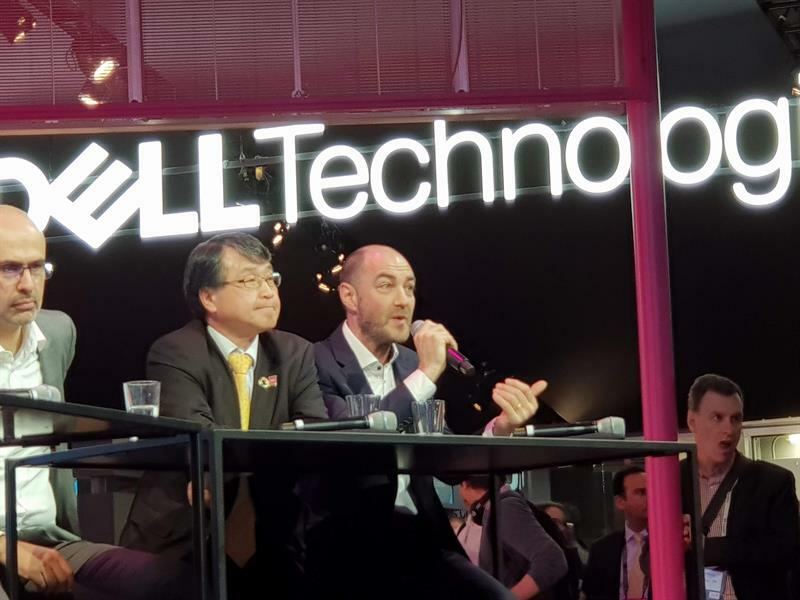 “We’re massive fans of AI and machine learning and we’re using those techniques to deliver the right service quality into those [vertical industry] environments,” replied Vodafone’s Luke Ibbetson (pictured below, centre). On the show floor, I got a chance to get a test and measurement perspective from Jonathan Borrill, director, engineering and technology at Anritsu. He explained that the technical challenges associated with sub-6GHz 5G are very similar to LTE in terms of out-of-band emissions and adjacent channel leakage, while being harder due to 5G’s larger channel bandwidth (40, 50 or 100MHz compared with LTE’s 20MHz). On the millimetre wave side, he highlighted the engineering work required to reduce power consumption and ensure that smartphone form factor devices don’t overheat, and said millimetre beam management for mobile devices is still a challenge, which partially explains why the first use-cases for 5G millimetre wave will be fixed wireless access and wireless backhaul. 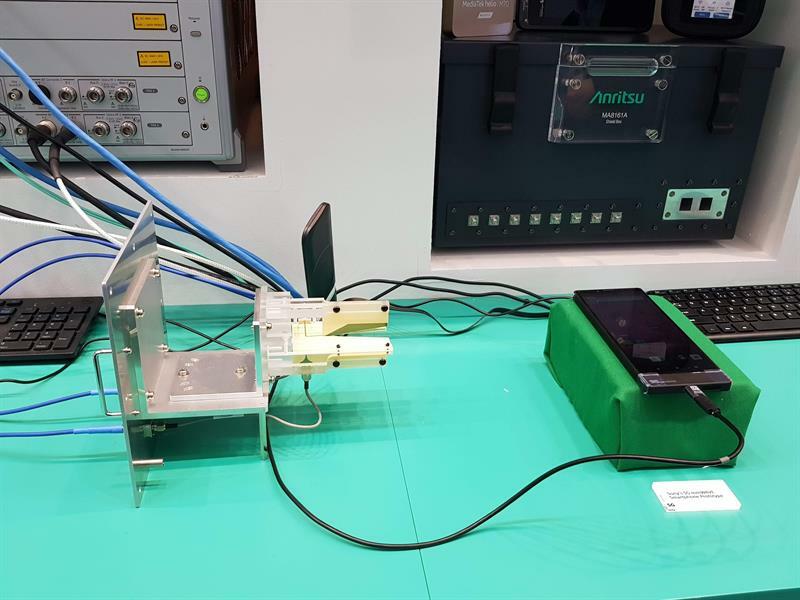 However, on the Anritsu stand, Borrill showed me a prototype Sony millimetre wave smartphone device (shown above) which was being used in combination with Anritsu’s cross-polar feed antenna and MT8000A test system to demonstrate 5G non-standalone over-the air coupling at 28GHz, achieving 2.4Gbps speeds with multiple 100MHz carriers. Seeing the messaging involved in the handset connecting to the network gives you a real feel for the staggering complexity that lies behind what most smartphone users take for granted. Borrill added that when it comes to measuring ultra-low latencies, there is a requirement for dedicated hardware, as you cannot simply connect a PC to the back of the testing equipment because the latency in the PC could be greater than that of the network you are testing. From what I heard at MWC, 5G may be ‘here’, but there is so much more to come. It will be interesting to see how the 5G story unfolds and whether the reality lives up to expectations.